The City Law School’s Professor of International Economic Law, Professor David Collins, chairs a well-received panel discussion. Financial Regulation during the Recovery was the title of lively panel discussion held on 1st June at the Cass Business School, chaired by the City Law School's (CLS) Professor of International Economic Law and LLM Programme Director, Professor David Collins. The panel featured Dr Joanna Perkins, Chief Executive Officer, Financial Markets Law Committee, Professor Ioannis Kokkoris, Centre for Commercial Legal Studies, Queen Mary University, Adam Berry, Senior Associate, Financial Services Disputes, Eversheds LLP and Nick Gray, Senior Regulatory Lawyer, Lloyds Banking Group. There were a number of CLS students and alumni in the capacity-filled venue. Several professionals were also in attendance, visiting from major law firms, hedge funds, and financial regulators. 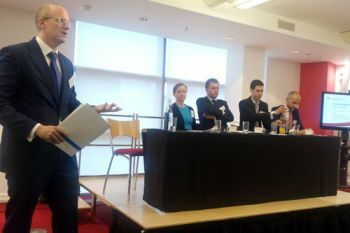 Lively debate took place after the panellists gave their respective presentations, with some questions from the audience about the likelihood of a second financial crisis and how the industry, especially the banks themselves, would respond to it. Many themes were explored and there was a general emphasis on a need for greater coordinator among the regulators as well as the various financial institutions to maintain stability. Financial regulation refers to the laws and rules that govern what financial institutions such as banks, brokers and investment companies can do. These rules are generally promulgated by government regulators or international groups to protect investors, maintain orderly markets and promote financial stability. The range of regulatory activities can include setting minimum standards for capital and conduct, making regular inspections, and investigating and prosecuting misconduct.